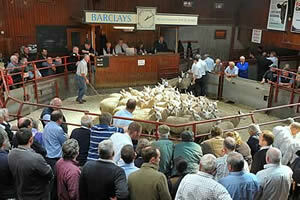 The Cumberland & Dumfriesshire Farmers Mart had forward 9,243 Store Lambs (including 3,001 Cheviots & 2,528 Blackfaces) at their Weekly Sale at Longtown on Tuesday 18th October, 2011. A very good entry and with several distant buyers to the fore, all classes the dearest of the season. Top of £79 for Texels from Greenknowe and Low Stokoe, others to £76 Rinnion Hills and Cherry Garth; Beltex £76.50 Greenknowe; Suffolk £76.50 Lamberton, £74.50 Coshogle, £71.50 High Lovelady Shield; North Country Cheviot £71.50, £70 Alnham Castlehill, £70 East Murton; Greyface £71 Low Stokoe, £69.50 Wanwood Hill, £69 Nethertown; Charollais £69 Red Gap and Low Stokoe; Cheviot Mule £66 Geltsdale, £61.50 Powisholm; Swaledale £43.50 Nookton, £40 Byers Hall. Cast ewes to £90 Amos Hill, hill types £61 Bayles. At the Show & Sale of Hill Cheviots (sponsored by the Hill Cheviot Society) there was a record entry of 3,001. Trade was the best ever experienced at this centre. 1st– Messrs Hepburn, Lymiecleugh, Teviothead, sold at £69. 2nd – Messrs McGarva, Granton, Moffat, sold at £67. 3rd – Mrs L. Luescher, Glendinning, Westerkirk, sold at £64. At the Show & Sale of Blackfaces (sponsored by the Blackface Sheep Society) there was also a record entry of 2,528. Quality and trade was animated throughout, many more could have been sold. 1st – Messrs Famelton, Horseholme, Gilsland, sold at £69. 2nd – Messrs W.S. Robson & Co., Yatesfield, Otterburn, sold at £63.50. 3rd – Messrs Walton, Wanwood Hill, Alston, sold at £67. Both breeds were expertly judged by Mr Chris Brodie of Canonbie.